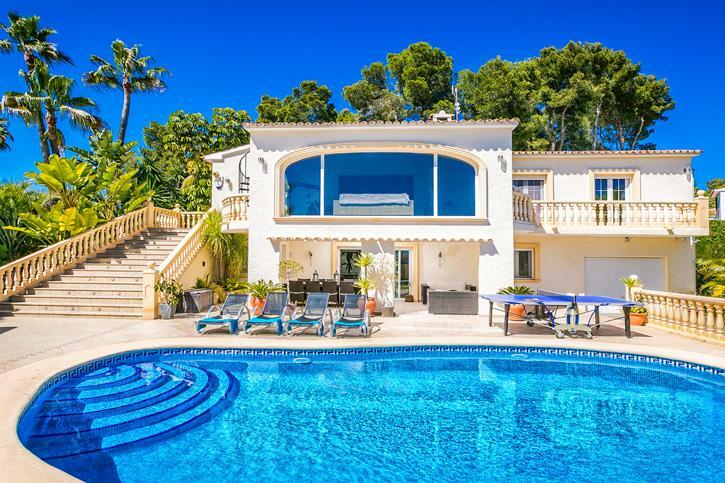 The villa offers luxurious accommodation that includes 4 bedrooms and 3 bathrooms arranged over two floors, with 2 bedrooms upstairs and 2 downstairs, plus a games room, spacious covered terraces on both floors and a custom-designed BBQ with bar facilities. The main entrance is to the upper floor via an easy-rising staircase and there is another to the lower area on the same level as the swimming pool terrace, providing suitability for the elderly and infirm. On the upper level there is an entrance hall with a family shower room. A doorway leads into the open plan lounge with a 50” LED television, comfortable / modern sofas and a spacious naya (covered terrace) with a stunning seating / sofa area featuring a huge window with panoramic sea views. The lounge area leads onto a modern dining area with seating for 8 people and 2 large wine fridges and a large American-style ultra-modern kitchen with dishwasher, microwave, oven and central hot-plate. A short hallway leads on to the upstairs bedrooms. The spacious king-sized master suite features air conditioning, a range of luxurious wardrobes, a TV and an en-suite bathroom a spacious walk-in shower. The master bedroom also has patio doors leading to a balcony overlooking the pool area and leading back into the naya area. This floor also provides a single-bedded room with another pull-out bed below which raises to the height of the other to provide two single beds. From this floor internal stairs lead down into a small hallway with a family bathroom offering a bath, shower and wc. From the hallway there is a spacious twin bedroom with air conditioning, lots of wardrobe space and another double bed room also with air conditioning which boasts a stunning feature wall, desk, chair and lots of wardrobe space. There is also a spacious games room featuring a pool table, dart-board, & sofa and relaxing chair. On this floor there is a large utility room which is fully equipped with washing machine, tumble-dryer, iron, ironing board and space and storage space for things like suitcases. The games room has large patio doors leading out onto another covered, alfresco dining area with a dining table and a seating area overlooking the pool area. Outside, the larger than average 9 m x 5 m private pool has Roman steps into the shallow end, spacious surrounding terraces, an outside shower, a bar and BBQ area. The tastefully landscaped garden features a cabaña with seating, table & wine fridge, lawned areas. The villa also offers a children's play area with swings, a slide and see-saw and large library of adult and children´s books, games, a WiFi games console, DVDs & children´s toys. Due to the quality of the furniture, fixtures and fittings a refundable inventory deposit of £700 is also required prior to arrival which will be returned within 10 days of departure. Accommodation Overview: 1 king-size bedroom, 1 double bedroom, 1 bedroom with 2 single beds, 1 bedroom with one single bed and a second pull-out single bed. Sleeps 8. A wonderful well equipped villa perfect for our party that consisted of 6 adults and 2 teenagers. Walking distance to supermarket and good restaurants. A bit further for the beach, especially main beach resort, but we enjoyed our strolls and had the car when required. Would definitely return to Moraira as the people are so friendly! Only gripe was the one bedroom with no air conditioning where the occupants struggled a bit. Also very happy with Direct Villa Holiday - an easy process to book and answered any queries quickly and efficiently. We were especially pleased with the late check-out (flight was 2350) - I know they cannot always accommodate this but they were very open to the request and helped where they could.